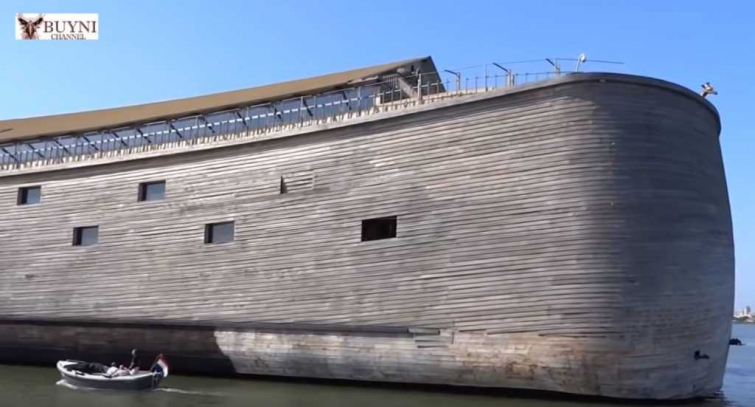 Johan Huibers, the Dutch builder behind the gargantuan replica of Noah’s Ark revealed his latest and loftiest plan for the boat: he wants to sail it all the way to Israel. The $1.3 million price tag, however, may set him back from making his journey across the Atlantic. The massive ship measures a whopping 390 feet long and 75 feet high. It took four years and approximately 4 million euros to build. While the prohibitive cost of the voyage is currently holding him back, Huibers hopes instead to bring "the experience of hope through the teachings of Jesus Christ to visitors worldwide" through his “Ark of Noah” attraction on the Maas River in the Netherlands. According to his website, “hundreds of thousands” of tourists have already visited the 5,000-person capacity ship, constructed from pine and cedar wood. After a global career in ministry, Huibers first became inspired to build his ark replica one night when he read the story of Noah to his children. This isn't the first time Huiber's ark has made headlines, as it came loose from its mooring and crashed into several smaller boats in the Dutch port of Urk in January of this year. A group of people were aboard the vessel, but were rescued by the Royal Netherlands Sea Rescue Institution.